I’m afraid I’m getting awfully behind on reviews yet again, so it’s time for another one of these many-birds-with-one-stone posts. Sadly I can’t even claim a thematic similarity between the books this time around, so please bear with me! First of all, I finally read William Golding’s classic Lord of the Flies, and I did like it quite a lot. But I’m afraid that this is one of those cases in which a book’s cultural resonance made it have less of an impact on me as a reader: neither the story nor the themes felt new, as I’ve caught echoes of them in so many other stories over time. Of course, part of the fun of reading classics is exactly being able to trace these echoes back to their original sources. I suppose there’s also the fact that it’s 2011 and not 1954, and the idea of well brought-up children doing horrible things no longer shocks or surprise us. They might, and we know that they might. But they also might not. If there was one thing that put me off, it was the inevitability of it all in the story. I don’t think violence is inevitable, and I find complete pessimism about human nature every bit as naïve as Rousseau-like idealism. I don’t think “human nature” is essentially anything by definition – it can go either way, really. Though you could of course argue that Golding acknowledges this by having characters go both ways, and that his point is more about humanity as a collective than about any individual’s essential nature. Therefore, there will always be violence because there will always be some people going the Jack Merridew way. This is a fair enough point, though part of me wants to believe that we can do can do better, all of us. But that’s perhaps stepping into the opposite spectrum of idealism. freckles. He noticed that he still held the knife aloft and brought his arm down replacing the blade in the sheath. Then they all three laughed ashamedly and began to climb back to the track. 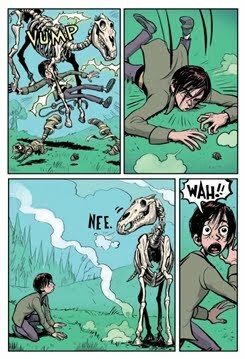 And now for something completely different: Ghostopolis by Doug TenNapel is a graphic novel about a boy, Garth Hale, who is accidentally transported to the land of the dead. Garth actually suffers from a serious illness, but he knows that his time hasn’t come quite yet. Frank Gallows, the clumsy ghost hunter who accidentally sent Garth to the spirit world, is doing his best to save him. But in the meantime, Garth has time to find the grandfather he never met, who is now a ghost trying to make amends for his estrangement from his daughter. I quite liked the humour in Ghostopolis, as well as the cartoonish art style that emphasises it, like you can see in the samples below. Best of all, neither of these nullify the story’s emotional weight – in some ways, it actually makes it stand out. Ghostopolis may not be about to be added to my list of all-time favourites, but it was a fun read, with lots of action and adventure as well as a stark look at life, death, family history, and the complexities of human relationships. Doret read it too, so make sure you read her much better post. Time for another classic: I finally got around to reading my first Muriel Spark, The Prime of Miss Jean Brodie, a fact for which Claire is entirely to blame. This is the first of many Muriel Sparks to come, as I loved her writing and her dark sense of humour. The Prime of Miss Jean Brodie is a non-linear narrative set at an Edinburgh boarding school in the 1930’s. This might be the most unlikely literary comparison ever, but Sparks’ narrative style reminded me slightly of Kurt Vonnegut – possibly because he’s the only other authors I’ve seen use flash forward this effectively. Miss Jean Brodie is a teacher at the school where the story is set, and the plot concerns itself with a group of girls known as the Brodie set, and with the events that lead to one of them betraying Miss Brodie. The Prime of Miss Jean Brodie is a compact but very layered novel, and I imagine I will get even more out of it on a second read. What stood out to me this time around was Spark’s subtle commentary on the dark side of charisma, on sexuality, and on education and social mores. There were legions of her kind during the nineteen-thirties, women from the age of thirty and upward, who crowded their war-bereaved spinsterhood with voyages of discovery into new ideas and energetic practices in art of social welfare, education or religion. The progressive spinsters of Edinburgh did not teach in schools, especially in schools of traditional character like Marcia Blaine's School for Girls. It was in this that Miss Brodie was, as the rest of the staff spinsterhood put it, a trifle out of place. Outwardly she differed from the rest of the teaching staff in that she was still in a state of fluctuating development, whereas they had only too understandably not trusted themselves to change their minds, particularly on ethical questions, after the age of twenty. 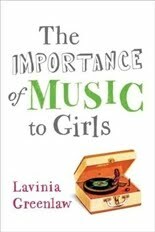 The Importance of Music to Girls by Lavinia Greenlaw was more or less a random library find. I couldn’t resist the cover or title, but when I got home I found out it was actually on my Bookmooch wishlist already. Why does this happen more and more often these days? Anyway, the book is quite different than I initially expected. Instead of a sociological study about the role music plays in girls’ lives, or perhaps about the very clear gender imbalance in indie rock, it’s a memoir of growing up with music in 1970’s Britain. Which I’d be all over anyway, mind you – I just wonder if the sort of book I imagined does exist. And if not, who can I bribe to write it? What takes three minutes to play seemed to take ten minutes to listen to. It provoked emotions and suggested circumstances I couldn’t wait to experience – being trapped by regret or riveted by desire; trying to be offhand about passion or grown-up about loss; moving on or giving in. It was, for me, a rehearsal of feeling. A woman who babysat for us remembered me at the age of eight, throwing myself back on a chaise-longue and declaring that what I wanted when I grew up was peace in my life. Listening to Nashville Skyline, I could be quiet at least: someone else as making my noise for me. If I had not kissed anyone, or danced with anyone, or had a reason to cry, the music made me feel as if I had gone through all that anyway. Because the music was charged and we were no more singular than iron fillings, no less easily moved as the music attracted and repelled, organised and disturbed and then let us into the night, clusters of emotions ready to dissolve into sleep. Often I was the only girl but I had yet to think that that had any implications. I knew there was those for whom music was soundtrack and those of us for whom it was, well, music, but I didn’t notice that most of those who took it seriously were boys. Sophie and Julia each had a few records but they didn’t get upset or excited about bands. I was thrilled by discovery, crushed by disappointment and mortified by any misplaced enthusiasm I had shown. I declared my allegiances, took a position, and always had a view, not noticing that girls were bemused and boys found me boring. Was a girl not supposed to feel so strongly, let alone want so much to possess and know something for her own sake? Finally, there’s Wildthorn by Jane Eagland, which I picked up because I’d seen it described as a sort of YA Fingersmith. This description made me both excited and wary: on the one hand, yay, a book kind of like Fingersmith! But on the other hand, I don’t need other books to try to be Fingersmith when Fingersmith already is Fingersmith, if that makes sense. Wildthorn is the story of a Victorian teenager, Louisa Cosgrove, who for reasons completely unknown to her has been shut in a mental asylum by the name of Wildthorn. The novel moves back and forth between the present day and the story of Louisa’s unconventional upbringing, which gives us hints of why she has been deemed mad and shut away – and by whom. I can see why Wildthorn has been compared to Fingersmith — Victorian mental asylums, an analysis of gender and of madness as a tool of control, an unapologetic feminist stance, a lesbian love story, mistaken identities, you name it: it has it all. But I shall refrain from even attempting to compare Jane Eagland’s writing to Sarah Waters’, as I don’t think it would be fair at all. I lay still, aware of the warmth of her body beside me, of that strange, sweet feeling in the pit of my stomach. I had the oddest desire to put my arms round her and hold her close. I felt such a longing, a painful, lovely feeling that we might be like this always, that we might never be apart. And suddenly with a hot rush it came to me: I love Grace. I love her. In a confused way I knew I didn’t just love her as cousins do. This was different, this was… I felt… I felt about her in the way that she felt about Charles! Nevertheless, I’d recommend Wildthorn to teens – or adults – with a budding interest in feminism, the Victorian period, or (like me) the relationship between the two. It would make a good introduction to the topic, and for all its shortcomings it was quite a gripping read. As always, if you have read any of these feel free to leave me your link. Oh dear to Wildthorn. It sounds like it might remind me of 'The Rose of Sebastapol' where the reader is like 'I get it, your female cousin is clearly in love with you, why don't YOU get it? Agh another mysterious hint about your cousin being a lesbian whcih you will fail to interpret correctly'. It's hard to know how much leaway a reader should give for lesbianism being something that wasn't talked about in general society in Victorian times, maybe she just wouldn't even understand the possibility? I think there's got to be a bit of a conscesion made between realism and reader patience in that case. Might pop back once I've read it as it's in my stacks somewhere. oh my.. you REALLY should see the movie of The Prime of Miss Jean Brodie! The movie is excellent and Maggie Smith is most wonderful! I read Lord of the Flies in high school, and I wasn't crazy about it, partly because it was required reading and partly because of its fatalistic view of human nature. I can't deny that it's been influential, though. The premise of Wildthorn sounds so promising. It's a shame it was a bit of a disappointment. "On the one hand, yay, a book kind of like Fingersmith! But on the other hand, I don’t need other books to try to be Fingersmith when Fingersmith already is Fingersmith, if that makes sense." This totally rocks and it made my day! I also read Lord of the Flies a long time ago, and think I missed so much of the intended messages, because I spent so much time feeling bereft for Piggy. I love mini-reviews! :) I can't say thank you enough for sharing the graphic novel. Since I'm not well-versed, nor keep up on them, it's always nice to have bloggers point me in the direction of some more that I can read. I really do need to read a Muriel Spark novel though as well, so it was nice to be reminded of an author I've forgotten. Jodie: Sadly, in Wildthorn it wasn't even just with realising her own sexual orientation that Louisa was so slow - it was with everything :S That made it a bit harder for me to be forgiving. Though yes, I think it CAN he hard to balance realism and reader patience. But it might be a good idea to let the latter win :P Anyway, I'd really love to hear your thoughts on Wildthorn as a whole, so I hope you do read it. Deslily: Now that I've read the book I definitely will! Stephanie: A lot of people who read it in school seem to hate it! I wonder if it's the obligatory nature of it all? Amanda: It's not so much that I think he's wrong as it is that part of me WANTS him to be. I know things can very easily go as they did in the story, but maybe there will be times when they don't? Anyway, I can imagine how having children that age would make it more disturbing! I can't wait to read The Prime of Miss Jean Brodie! It has been on my list for a while & this makes me want to move it up. I loved Hedgehog as well. So, I hate, and I mean HATE Lord of the Flies. I read it in high school and never want to see it again! That teacher destroyed that book. That's for sure! Ghostopolis looks interesting. I will have to give it a read! I have never read Muriel Spark before, but I should! Love your reviews -- what a fun handful. 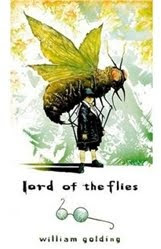 I read Lord of the Flies in high school -- it seemed like required reading, along with Catcher In The Rye -- and liked it although it's kind of harsh. It's more of a 'put this one under your belt' kind of book than a "oh I loved it" kind of book. I read 'Lord of the Flies' when I was seventeen, I think, on holiday. I didn't hate the book at all - I thought it was powerful and moving. Of course Golding wouldn't write about a group of boys camping on the island like the Swallows and Amazons, because that would have been dull (and Ransome did it pretty well to begin with!). I've only ever read 'Memento Mori' by Muriel Spark, but I'd recommend it. The prose is wickedly sharp, and she's funny, too. Though you could of course argue that Golding acknowledges this by having characters go both ways, and that his point is more about humanity as a collective than about any individual’s essential nature. I agree. I also think, though it's been a long time since I've read it, that there's a comment about socialization going on here as well. It's not like the kids arrive on the island as blank slates, just as slates that haven't been written on QUITE as much as adults would have been. So, as I recall, we see the way both Ralph and Jack have been groomed to vie for predominance - that's probably what they saw their fathers doing, and what their fathers encouraged them to do albeit in a more civilized, public-school way. Piggy, on the other hand, is already in a marginalized position way before they crash on the island. So to me it's less a story about inherent human nature, than a parable about how young children absorb the social systems taught to them and parrot them back. And the expected reader reaction is how adults often don't expect children to be such keen observers and duplicators of the ugly ways the adults are teaching them to behave. I'm glad you enjoyed Lord of the Flies, even it seemed sort of anti-climactic. I first read it in middle school, and absolutely loved it--totally creeped me out. But when I reread a couple years ago with Annie, I think I found it even more unsettling, because I couldn't help but picture Max and Gray among the young ones on the island. Very unnerving. But I'm totally with you--while that sort of outcome is certainly possible, I don't think it is inevitable by any means. Rich and Gray have both read Ghostopolis, and I've been wanting to. I think I now want to even more. And you know, it might be just what I need at the moment since I'm having concentration problems. Maybe a graphic novel could break through that. And Wildthorn---hmmm. You've left me torn on that one. I think I would both love it and be annoyed with it all at once. Oh hell, why don't I just read Fingersmith already instead, huh? I see Lord of the Flies as a sort of foil to a book like, say, Where the Wild Things Are. WTWTA starts with the assumption that kids are wise enough to do better than the world teaches them to do, if given the chance, even if sometimes they'll do stupid things too. LoTF comes from the opposite tack. I think it is very telling that one deals with a big group of children, and one with a single child - I think that most people see the ugliness of human behaviour in a group, versus an individual more easily. Even in LoTF, the individual KIDS aren't really 'wicked', you can sympathize and understand each one's bad reactions - it's only, as a group it is easiest for the children to cohere around a lowest denominator. That's not to say I agree, or that I think this is how it must always be. Having recently been reexposed to the way that British style boarding schools for boys worked through Ulysses, I will say that MS Emily's talk of how the kids are simply socialized responses has some resonance for me. I think the mistake (and perhaps Golding himself makes it?) is to assume that children are a good example of raw, untaught human nature. On the contrary, children are far more socialized in many ways than adults - now that I'm grown up and do not have to be institutionalized for 8 hours a day, I find that I'm far less integrated into the social fabric of the community than I was as a child. On a seperate, and maybe off-topic note, isn't it strange that a lot of Lesbian novels that touch on the Victorian period have the lovers as cousins or relations in some way? Even if not directly. In Fingersmith they are, in a sort of sense, sisters. In, say, Summit AVenue (have you read that one? I thik you'd love it!) they aren't related, but the older woman acts as a surrogate mother of sorts. Homosexual male books don't strike me that way - maybe it's just tha tI haven't read as many. I wonder why that is. There aren't, I presume, a lot of books about contemporary lesbian cousins/sisters/whatever, and fewer, I'd think about relationships that resemble those family ones. Huh. Glad to hear you liked Ghostopolis! My daughter has read that book six times in the past few weeks. I love what it has done for her. The Prime of Miss Jean Brodie was the first Spark novel that I read and thought we would have a long future ahead but sadly I haven't really liked any of her other books that I have tried. I'll be interested to see how you do with her going forward. I remember reading Lord of the Flies in high school and absolutely hating it. In fact, it is one of those classics that I feel like I should reread but probably won't because I had such strong feelings about it back then. Wildthorn does sound interesting even though I've never read Fingersmith. I'm actually currently reading my first Water's novel so I'm looking forward to reading her other novels at some point. "Instead of a sociological study about the role music plays in girls’ lives, or perhaps about the very clear gender imbalance in indie rock, it’s a memoir of growing up with music in 1970’s Britain. Which I’d be all over anyway, mind you – I just wonder if the sort of book I imagined does exist. And if not, who can I bribe to write it?" Could we make that a project if we fail to find a job next year? Elisabeth: I hope you'll enjoy it as much as I did! Daphne: Yeah, it IS kind of one of those. Though I did like it a lot, quite a bit more than I expected to. ela21: I still need to read Swallows and Amazons :P But yeah, I'm glad Golding decided to do another thing altogether! Emily, Teresa and Jason: Thanks for sharing your thoughts on Lord of the Flies - I really enjoyed reading them, and I'm replying to all of them together because I love how you kind of elaborated on each other's ideas. The socialisation thing is such a good point. It puts me in mind of something Cordelia Fine says in Delusions of Gender - that even parents who don't believe in gender essentialism to begin with often fall back into it when their toddlers start behaving in stereotypical male or female ways. This is because of the whole idea that children are a tabula rasa - they don't pause to consider how even by age 2 or 3 they'll already have absorbed A LOT, including the clearly defined gender stereotypes all around them. If this is the case with children this young, it would be much more so with 6 to 13 year-olds. The nuclear war that's hinted at in the beginning of the book is something I had forgotten about, but yes, now that I think about it it's certainly important. Debi: I can definitely see your and Amanda's point about how having children would make this a much more disturbing read! You know what else I kept thinking about? How mucn Nation echoes Lord of the Flies, but in a far kinder (and yet not saccharine) way. I hope you'll enjoy Ghostopilis! I didn't loooove it, but it was certainly a smile-inducing read. Jason: The cousins thing is interesting indeed! I wonder if it has to do with how limited a woman's social circle was, for the most part? They had cousins, old family friends, and who else really? I haven't read Summit Avenue yet, but I definitely will. Kristen M: Sorry to hear you didn't get on with Spark's other books!! Fingers crossed that I have more luck. Claire: I'm looking forward to hearing your thoughts on your first Spark! Rebecca: The writing was indeed amazing! I can imagine wanting to read him again for that alone even if I hadn't liked it as a whole. Iris: Haha, wouldn't that be awesome?